Both the Samford University men’s and women’s basketball teams will compete in the 2015 Southern Conference Tournament this week in Asheville, North Carolina. The men’s team will begin play in the tournament on Friday at 5 p.m. (CST) as the Bulldogs square off against UNCG for the second time in eight days. 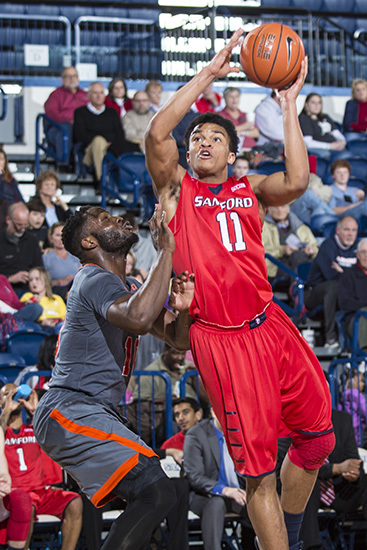 On Feb. 26, Samford traveled to Greensboro, N.C., and suffered an 81-67 setback against the Spartans. Earlier this season, the Bulldogs played host to UNCG on Jan. 22, and tallied an 89-78 victory at the Pete Hanna Center. The winner of Friday’s SoCon Tournament first-round matchup will advance to face top-seeded Wofford on Saturday at 11 a.m. The Bulldogs lost a pair of games against Wofford this season, but played the Terriers close in each contest, falling just 68-65 at home on Jan. 3 and 72-62 in Spartanburg, S.C., on Jan. 10. Samford joined the SoCon in 2008 and will be playing in its seventh SoCon Tournament this season. The Bulldogs own a 3-6 all-time record in the SoCon Tournament and will be facing UNCG for the first time in postseason play. Last year, the Bulldogs defeated Appalachian State in the opening round of the tournament, 70-56, but then fell to top-seeded Davidson in the second round, 77-54. Samford, heading into the 2015 SoCon Tournament, holds the following records against league foes: Furman (1-3), The Citadel (1-1), Chattanooga (0-1), Appalachian State (1-0) and Davidson (0-1). The women’s basketball team earned the No. 4 seed for this week’s tournament and will take on the No. 5-seeded Furman Paladins Thursday at 1:15 p.m. (CST). Samford and Furman split the regular-season series this season, with each team winning at home. Samford won the first meeting in the Pete Hanna Center, 76-65. Furman came back to win the second meeting in Greenville, S.C. by a score of 64-44. Thursday’s winner between Samford and Furman will advance to Friday’s semifinals to take on the winner of the contest between top-seeded and 17th-ranked Chattanooga and eighth-seeded UNCG. Samford swept UNCG this season, but the Bulldogs were swept by the Mocs. The women’s basketball team has posted an overall record of 10-4 in Southern Conference games since joining the league in 2008. The Bulldogs earned back-to-back SoCon Tournament titles in 2011 and 2012. The team also played in the championship game in 2010. In six previous SoCon Tournament appearances, the women’s basketball team has played the following opponents: Appalachian State (3-0), Chattanooga (1-1), Davidson (1-1), Elon (2-1), UNCG (1-0) Western Carolina (1-1) and Wofford (1-0). All Samford men’s games in the tournament can be heard on 100.5-FM JOX2 in the Birmingham area. The Samford women’s games will be broadcast on WVSU-FM 91.1.